There is a $50 Annual Registration fee due with September's tuition or upon enrollment. Gymnastics Tuition is auto deducted from your account on the 1st of every month. We accept cash, Visa, Mastercard, & Discover. Each class is 55 minutes long. Please make sure your child arrives a few minutes early so they are on time to stretch, as stretching is extremely important to prevent injuries. If your child is more than 10 minutes late and misses warm-ups or stretching they will not be allowed into a class. They will need to schedule a make-up class through the office. Girls need to be in a leotard (no skirts), with their hair pulled back out of their face. 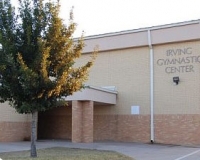 Boys need to be in an Irving Gymnastics T-shirt ($15 each), elastic waistband shorts. Classes subject to cancel or combine at any time. Minimum of 4 students per class.